Shelves are held short for wire passage. Wiring access plate in floor. No rear access or venting. Casters or levelers as required. Equipment cabinets with shelves are vented top and bottom and have a removable rear access panel to service equipment. A 7"x9" floor access plate in the rear floor makes floor access easy. Casters or levelers as required. Rack cabinets are vented top and bottom and have removable access panels to service equipment. A 7”x9” floor access plate in the rear floor makes floor access easy. Front and rear rack included. Rack cabinets are vented top and bottom and have removable access panels to service equipment. A 7"x9" floor access plate in the rear floor makes floor access easy. Front and rear rack included. CPU and Rack cabinets are vented top and bottom and have removable access panels to service equipment. A 7"x9" floor access plate in the rear floor makes floor access easy. Front and rear rack included. Levelers or casters as required. The document camera drawer is above a cabinet. Equipment versions have rear access and venting. A 7"x9" floor access plate in the rear floor makes floor access easy. The document camera drawer locks. Levelers or casters as required. CPU and Rack cabinets are vented top and bottom and have removable access panels to service equipment. A 7"x9" floor access plate in the rear floor makes floor access easy. Front and rear rack included. The document camera drawer locks. Levelers or casters as required. Go from 30" sitting height to 38" standing height in seconds. Quiet, smooth, and reliable. Unbalanced loads are not a problem. Easy to operate from a wheelchair. We have created a mechanism that electrically rotates a monitor in a table or desk at the touch of a button. The movement is quiet, sturdy, and reliable. Works with most monitors up to 24 inches diagonally. These custom top edges all add a solid band of hardwood around the top. This protects the top surface (veneer or laminate) and the solid edge is very durable. This pricing is for desks, credenzas, workstations, and cabinets. This t-mold edge adds a durable plastic band around the top. This protects the top surface (veneer or laminate). The corners of the top have to be rounded. Available in a wide variety of colors and styles. 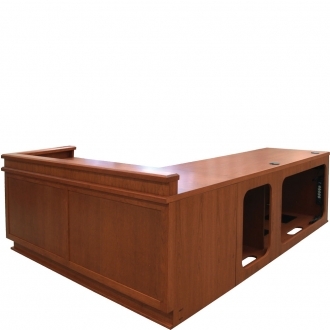 This pricing is for desks, credenzas, workstations, and cabinets. Solid wood molding can be added to serve as a handrail or as decorative trim. Pricing is for profile shown. Other styles are available at an additional cost.